Injustice: Gods Among Us was originally set to receive exclusive Superman: Red Son pre-order content for UK retailers, but luckily, GameStop is now officially bringing the content to their North American stores. 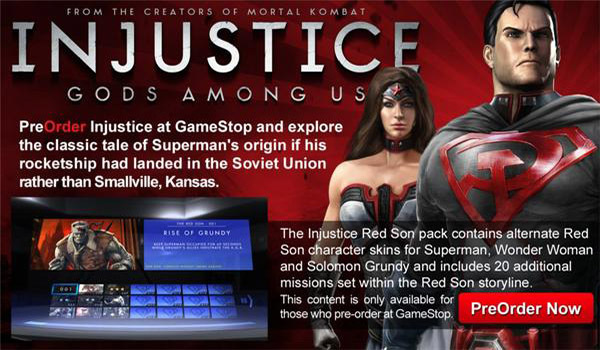 Anyone that decides to pre-order Injustice, at GameStop, will receive the Red Son inspired costumes for Superman, Wonder Woman, and even Solomon Grundy. The best part of the exclusive bonus pack though would have to be the additional 20 missions set within the Red Son storyline. It remains unclear whether these missions will be separate from the core Injustice game experience, but it is certainly a welcome addition for fans of the groundbreaking alternate origin story for the Man of Steel. Oh, you’re not familiar with this alternate Superman storyline? Well, I have to ask, what have you even been doing with your comic book life? Superman: Red Son, by Grant Morrison, explores the idea of what would have become of Kal-El if his ship landed in Russia. During the 1950s, the Soviet Union unveils Superman as a powerful government asset, and as a result, panic erupts throughout the United States. The knowledge of alien powers effectively shifts the focus of the Cold War arms race from nuclear to superhuman. Needless to say, the concept behind the Red Son storyline is a truly unique narrative that offers a groundbreaking view of what Superman could have become. With Injustice: Gods Among Us’ launch date rapidly approaching, it will be interesting to see how NetherRealm handles the Soviet Superman, and exactly where it will take us. What do you think? Will the Red Son content bring players closer to Millar’s vision, or is it going to fall short? Make your voice heard in the comments below, and stay tuned for more info as it releases.